On March 3, 2017, Professor Francesco Francioni was designated by the parties by a supplemental agreement to be the appointing authority, whose function is to form the International Commission of Inquiry. Professor Francioni is an ad hoc judge on the International Tribunal for the Law of the Sea as well as serving as one of five arbitrators in a dispute under the auspices of the Permanent Court of Arbitration, The “Enrica Lexie” Case (Italy v. India). The parties notified the appointing authority that the prospective commissioners shall not United States citizens; must have command of the English language; have expertise in international humanitarian law; and include, at least, one woman. Article I of the Special Agreement was amended by the parties on March 26, 2017 to allow the Commission to designate a Secretary General to serve as a registry, and for the President of the Commission to work with the Secretary General in order to determine a location for the sitting of the Commission. The only stipulation by the parties is that the sitting shall be in Europe. This entry was posted in Education, International Law, War Crimes by Hawaiian Kingdom. Bookmark the permalink. 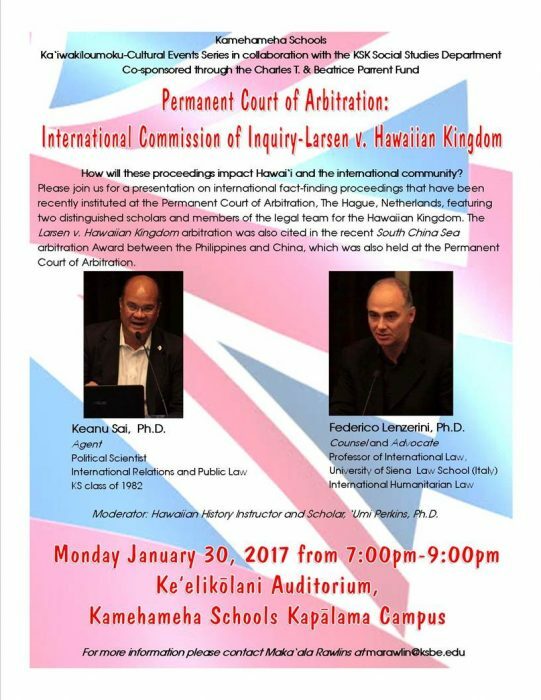 I very much appreciate your ongoing efforts in seeking justice for the Hawaiian Kingdom. Mahalo! How do we handle this????? Ballistic missile launches by North Korea and Iran are among the first tests being faced by the new Trump Administration – literally, trial by fire. The latest North Korean launches occurred on March 6th, when Pyongyang fired four missiles towards Japan. The Administration’s response will be key to defining how the outside world — both friend and foe — comes to view “Trump’s America”. It is the duty of any government to protect the homeland, and the U.S. is no exception. Hawaii, located as it is in the Pacific, could become a target of North Korean nuclear aggression, as Adm. William E. Gortney, Commander of the U.S. Northern Command, has warned. North Korea and Iran are both striving to build ballistic missiles. North Korean ones would be capable of reaching Alaska and Hawaii, and eventually, their Intercontinental Ballistic Missiles (ICBMs) that could target the continental U.S. Pyongyang already has a number of land- and submarine-based liquid fuel and solid fuel ballistic missiles. These include the Taepodong-2, which has a range of at least 5,500 km, and so is capable of hitting U.S. territory. In 2006, North Korea attempted a launch of the Taepodong-2 that failed, but in 2012, its “civilian” version put a satellite into orbit. Then on February 7, 2016 a space-launched version of Taepodong-2, the Unha-3, successfully placed the Kwamongsong-3 satellite into orbit, suggesting that the system is now in working order. When Prime Minister Shinzo Abe visited Washington, a solid-fuel intermediate missile launch by Pyongyang disrupted his visit. This was followed by the March 6, 2017 launch, prompting a statement from President Trump that the U.S. stands staunchly with our Japanese ally. Clearly, it is not only America’s allies that require protection. Today, the world’s only communist hereditary monarchy can also hit Alaska, Hawaii and the continental U.S. with submarine launched ballistic missiles. The North Korean missile threat needs to be countered. Hawaii, with its 11 military bases and its symbolic role in U.S. history as scene of the 1941 Pearl Harbor attack, is a plum target for the increasingly bellicose Kim regime. ‪To counter this growing threat, the Missile Defense Agency (MDA) is pursuing the development of a new and costly Homeland Discrimination Radar Hawaii (HDR-HI) system. However, the technology for the HDR-HI is untested, and the Ground Based Midcourse Defense (GMD) ICBM interceptors that this new radar would use and are currently deployed in Alaska and California are expensive – with a price tag of up to $100 million per interceptor missile. Developing and deploying the HDR-HI system could take up to 10 years – with no guarantee of success. Earlier, the MDA attempted to develop a 9-12 satellite constellation called the Precision Tracking System – only to cancel it without a single satellite launch. The cost to the U.S. taxpayer came to $230 million. The agency has also spent over $1 billion on space-based sensors to determine missile launches and intercept warheads in flight – yet no working system has been deployed. Instead of the HDR-HI, a combination of working, proven, and relatively inexpensive technologies are readily available to defend Hawaii – today. This multi-layer system should include the Terminal High Altitude Area Defense (THAAD) anti-ballistic missile system, the Army Navy/Transportable Radar Surveillance (AN/TPY-2) one of the Pentagon’s most capable radars, and Aegis Ashore equipped with SM-3 interceptor missiles. Aegis Ashore is already deployed in Romania against a potential Iranian and Russian threat, and will be deployed in Poland, despite Moscow’s misgivings. In addition, the U.S. just shipped THAAD to South Korea to defend against the North – despite loud Chinese protestations. To deter any hostile attempts on Hawaii, the U.S. Government needs to convert the Pacific Missile Range Facility at Barking Sands from a testing ground into a missile defense base for the relatively small investment of $41 million — as Adm. Harry B. Harris, Commander, U.S. Pacific Fleet, has suggested. The Trump Administration is increasing the military budget by $54 billion. To make Hawaii safe, Congress needs to allocate funding for an Aegis Ashore system with additional SM-3 interceptors (each costing several millions), and a truck-mounted THAAD system with 39 interceptors and the AN/TPY-2 radar, which can be procured for close to $1.6 billion. Deployment in this configuration would establish a multi-tiered missile defense of Hawaii, with not one, but three opportunities to shoot down any incoming North Korean warhead. The people of Hawaii, represented by their Congressional delegation, including the late Rep. Mark Takai (D-HI), Rep. Tulsi Gabbard (D-HI) and Rep. Colleen Hanabusa (D-HI) need a quick, reliable and cost-effective missile defense for their home. It is up to the White House, Congress, and the Pentagon to make it happen. The only thing that’s going to make Hawaii safe is that the U.S. occupation needs to come to an end. Does not matter what defenses the occupying power has to “protect Hawaii,” we are still in danger from foreign attack because of their presence here, which the people did not ask for and furthermore, did not want. Above all, it violates the Laws of Neutrality. I disagree. The time for the USA Military industrial complex to go home and get out of our islands is now. Play your war conspiracy somewhere else. Hawai’ians are smarter than you think and your reply certainly doesn’t fit the highly intelligent disclosure that invites thought and individual accountability. The United States is using Hawaii as a part of their defense shield to protect North America, similar to how Hawaii was used to intercept the Japan attack on Pearl Harbor. Begging them to install increased defenses for Hawaii is like asking them to drop their shield. Information has unfolded since the December 7, 1941 Japan attack on Pearl Harbor that the United States was aware of the looming attack in advance and welcomed it rather than defending against it. This gave them an excuse to engage in war with Japan to benefit the United States Military Industrial Complex, which are United States corporations that profit from war. If the installation of defense mechanisms for Hawaii surpassed United States corporate gains from war they might consider it, but war is much more profitable for United States corporations. The United States has also used self-inflicted wounds to justify wars against other nations. 9-11 is just one example. The United States government represents United States corporations that profit from war, illness, dirty energy, etc. The United States places a higher priority on it’s economy than on human life and environmental protection. This is United States government’s culture. The Hawaiian Kingdom can only hope to avoid an attack by enemies of the United States by promoting international recognition of our Neutral Nation status and the fact that our nation is a victim of a prolonged belligerent United States military occupation. Keanu, Leon, and others are doing a good job towards this end for which I am thankful.